A summer take on a christmas classic. 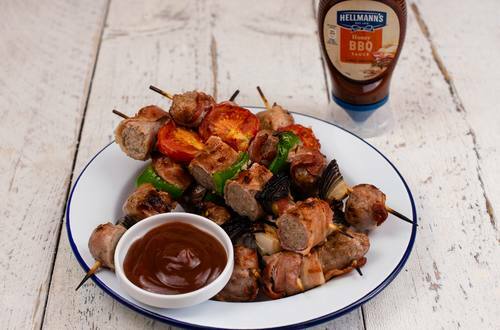 Sausages, streaky bacon, peppers, onions & tomato grilled over coal & finished with Hellmann's Honey BBQ Sauce. 1 Prepare bbq cook at medium heat. 2 Slice one side of the potato to create a flat side and place the potato, flat side down on a chopping board. Insert the skewers in to the potato in a horizontal line with even spaces in between. Twist each skewer in position to allow for easy removal once kebabs are constructed. 3 Wrap a sausage in a rasher of streaky bacon and place on the horizontally on the skewers, sliding it down to the base evenly space across each of the three skewers. Place a chunk of red onion on each skewer and slide down to meet the sausage. Repeat the wrapping and skewering process with the remaining three sausages, placing the peppers and tomatoes between them as with the red onions. 4 Once the kebabs are fully constructed, remove them from the potato as a singular piece, reserving the potato for another recipe.Place on the bbq and cook for 20 minutes, turning every 5 minutes, until sausages are piping hot throughout. 5 Remove the kebabs from the bbq and place on a chopping board. Slice the sausages vertically between the skewers separating each skewer from one another. Serve with Hellmann's Honey BBQ Sauce for dipping.